The NAHB Student Chapter at Cal Poly won third place in the Four-Year College category of the National Association of Home Builders (NAHB) Student Competition held at the 2019 NAHB International Builders’ Show (IBS) in Las Vegas. More than 67,000 home building professionals from around the world filled the exhibit halls of the Las Vegas Convention Center as NAHB hosted the 75th anniversary of the International Builders’ Show (IBS) Feb. 19-21. IBS and the Kitchen & Bath Industry Show (KBIS) once again combined for the annual Design & Construction Week® (DCW), which drew a total of more than 100,000 attendees. Exhibit space for IBS also expanded from last year’s 583,000 square feet to more than 608,000 square feet, where nearly 1,500 exhibitors displayed the latest in building products and technology. In all, DCW featured more than 2,000 exhibitors occupying more than one million square feet of indoor and outdoor spaces. Many of the exhibitors noted the increased foot traffic this year. 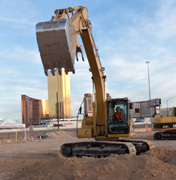 Next year, IBS and Design & Construction Week will return to Las Vegas, Jan. 21-23, 2020. Fifty-seven teams representing universities, community colleges, high schools and career technical schools across the U.S. participated in the annual competition. “The NAHB Student Advisory Board is proud that the competition has evolved into a prestigious event for the participants, their schools and the building industry,” said Justin Honey, faculty member at Pittsburg University and chairman of the NAHB Student Chapters Advisory Board. “Students will remember the competition for the rest of their lives. The judges were impressed with this year’s group, and we expect once again that the participants will be highly sought after when it comes to job offers,” said competition consultant, Dianne Slattery, Ph.D., Slattery Consulting.